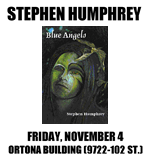 The literary arts meets the musical domain when former Edmonton writer and poet Stephen Humphrey performs a special reading from his new book, Blue Angels, with improvisational accompaniment by members of the Boreal Electroacoustic Music Society. Humphrey created a reputation as a poet and performance artist while living in Edmonton and was a frequent contributor to publications like the Edmonton Bullet, Slur, SEE Magazine and Vue Weekly before moving to Toronto in the 1990s. His life out east has allowed him to pursue his craft by hosting a literary radio program called HOWL on CIUT-FM, facilitating the long-running Idler Pub Reading Series, and producing an impressive body of written work. In his latest book, Blue Angels, published by Serraphim Editions, Humphrey draws from such influences as William Blake and Allen Ginsberg to examine diverse perceptions of angels from familiar images to the uncanny. The tome has been described as a "dark and gifted book" by poet Robert Priest and "equal parts Paradise Lost and Led Zeppelin IV" by multimedia artist Steve Venright. Confirmed BEAMS performers accompanying Humphrey include Reinhard Berg, Bill Damur and Don Ross. Tickets for the show are $7, $5 for BEAMS members, and are available only at the door. For more information, call 431-2126.